‘Communication’ is an important feature in any team that is looking at progress. And in a startup company where entrepreneurs mostly rely on freelance workers, it’s more likely that you have struggled without a clear medium of communication, and a distinct & effective system of communication becomes mandatory. Email – the only medium of communication really proved to be effective, but was not helpful in knowing a team’s work update but rather provided individual updates from the team members. With instant messaging being the craze these days, the need for a tool to be in touch with the team members at all times and that could act as a platform where people could update their work status became a fantasy. And with ‘Slack’ – the team collaboration software; this fantasy is now a reality. With provisions to add several integrations to it, slack definitely fits to be called the best team collaboration software. 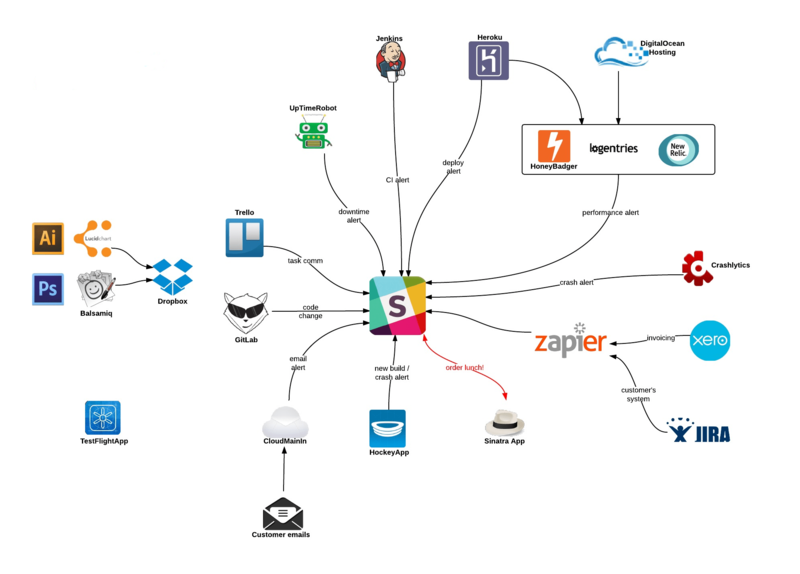 Here are a few useful top integrations that can make ‘Slack’ more significant. Be it a food delivery app or an app for your eCommerce business; having a few bugs or errors in the application’s initial running stages is evident and an effective system to track and report about the bugs is highly essential and with an application that is running through every article and ventricle of your business, an effective error detecting system is essential. ‘Airbrake’, the leading error reporting service provides error tracking for thousands of applications in several programming languages. With slack integrated with AirBrake; you will now get detailed reports on all errors (big or small) and allows swift debugging. The perfect slack integration to create a virtual room and setup a video conversation with about eight people for free with no logins required. A room is a space on web where people meet to talk. To create a room, just type a room name and click create. Copy the link to the room and send it to your friends via SMS, e-mail or over the phone. Everyone who clicks the link will enter the room. All participants in the room can hear and see each other; others who are out of the room cannot see or hear to them. Quite an easy way to have a meeting isn’t it? Integrate your Slack with ‘Bonusly’; the web platform that comes to as the possible online solution to recognize employee efforts and reward them with benefits either financially or non-financially. And at an application where there are regular updates on a project, a platform like Bonusly is sure to be celebrated by your employees and is a great technique to motivate your employees as well. It is quite boring when a chat at the office pantry or in the canteen at lunch is always about work. And it is more likely that your normal office conversation would get you bored in just a few minutes; especially on a tool like Slack where anything and everything is about work. A fun chat will add to the refreshment factor and the chat bot ‘Lita’ provides just that. A perfect online platform that acts as the cloud to all those application and website development companies with which companies no more have the need to pressurize on having a perfect server but can focus entirely on creating the product. With providing data services to millions of products already, have a secure virtual bank to store up your data. Much useful in a tool like Slack, where the most common files shared by employees are documents and blueprints. Datadog offers all high resolution metrics and events for manipulation and graphing. Datadog is designed to build to give visibility between the teams. It has a flexible pricing to match your dynamic infrastructure. With a complete set of information from all the servers, tools and applications; Datadog presents the user a complete view of your product. A must have Slack integration for any corporate. Cloud66 hooks up to your cloud provider and runs your application under your own cloud account. It can support anything other than containers and can manage your database servers, storage servers, load balancers and scheduled background jobs. This integration is brilliant and is a helpful tool in communication as well. Screenhero is perfectly designed for powerful real-time collaboration. Screenhero brings out multiple mouse cursor by which you can switch between navigating and driving, with no cognitive overhead. It also offers crisp and high quality voice chat in the range of 48 kHz. Lightning fast screen sharing makes the user feel he/she is working at the same desk. It is secure and cross platformed, which means you can share between Mac and windows. Offering you an easy and efficient way to manage your systems effectively; Pager Duty can now be integrated to your slack as well. Easy visibility to all your systems, super fast alerts that decrease your resolving time to almost half the real time- this is one tool every organization has to integrate to their slack. From monitoring your systems and your team’s performance to managing your customers, Pagerduty offers a solution to all. Finding it tough to figuring the information your data keeps telling you constantly? Integrate your slack with NewRelics; the best software that solves the purpose. Monitoring almost a million websites and more than a billion mobile applications; the software has and is successfully helping several startups become great corporate organizations. And at a platform where all your team’s efforts are put together, this is one such integration your Slack definitely has to have. Give a break to running between apps, Slack’s integration will keep all your company’s team information in a single place. Slack is a great tool Spencer! There are innumerable other apps that you can integrate with slack. These kinds of integrations can well -groom your team communication. 10 Motivational Books That Can Get You Kicking! Next articlePlus 1 -1 app simplifies personal interactions between your friends. Howler Teases The Funny Side Of You!